For centuries, Myrrh has been revered for its healing properties. Historically used in India, China, the middle East and probably best known as one of the gifts given to the baby Jesus by the Three Wise Men, Myrrh has been used to make incense, to provide therapeutic health benefits and as an anointing oil in spiritual ceremonies. The sap which this medicinal plant, Commiphora myrrha, produces contains a potent resin which is used today in topical ointments, massage oils, in fume baths and cosmetic products. It possesses an aromatic fragrance that is said to impart health and vigor. The magic of this ancient herb, when applied topically, works by alleviating pain and swelling, revitalizing circulation and relaxing stiff, aching muscles and joints. Magi Myrrh™ Massage Lotion is blended with nutrient-rich, organic Olive-Oil and moisturizing Lanolin and penetrates deeply to restore ease of movement. This unique blend of ingredients helps to strengthen and relax muscles, as well as relieve cramping. Muscle and joint stiffness are often relieved when there is more blood flowing through an area. Myrrh and organic Olive Oil are stimulating to the superficial circulation of the body, providing nourishment to the capillaries, aiding blood flow and improving motion. By increasing the blood flow to the obscure corners of your body, more nutrients and oxygen can reach parts of the body to assist function and improve mobility. These two substances together make an effective combination when rubbed into the skin. Lanolin moisturizes, soothes and protects the skin. Apply Magi Myrrh™ directly on the affected areas. Massage-in only as much as the body will absorb. A small amount goes a long way to relieve stress, relax the body, open the heart and uplift the mind. Experience the gift of the Magi. 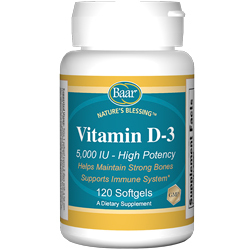 This entry was posted in Bone, Joint, and Muscle Health, New Products, Skin Health on June 30, 2015 by Dr. Bruce Baar. Glucosamine is a naturally occurring biological compound found in the body. It is vital for building cartilage, the rubbery, spongy tissue that enables joints to flex and move smoothly and easily. It is the joint “shock-absorber”. Because natural Glucosamine levels drop with age, the cartilage surrounding the joints can begin to deteriorate causing joint pain and stiffness. Supplementing with Glucosamine may help restore joint comfort thereby enhancing flexibility and mobility. Glucosamine is an essential building block to some of the main components of cartilage. These components act to trap and bind water into tissues that keep your cartilage hydrated and healthy. Typically, Glucosamine is derived from shellfish. Our vegetarian formula supplies GreenGrown® Glucosamine HCl, which is derived from a Non-GMO corn source, which makes this supplement safe for those with allergies to shellfish or those who are maintaining a vegetarian or vegan diet. 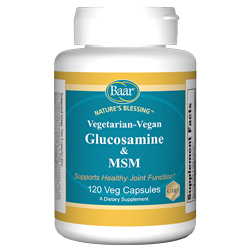 Why add MSM to Glucosamine? MSM, known as Methylsulfonymethane, is a naturally occurring sulfur compound found in almost every cell of the body. It is an important building block for collagen formation and for anti-oxidant production. It has been researched for its anti-inflammatory and pain-relieving benefits for muscles and tendons. MSM may be consumed as a supplement or through food products such as fruits, vegetables, poultry, fish, eggs, meats and milks. 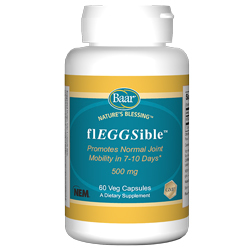 This nutraceutical has been found to ease joint stiffness, swelling and pain, especially when combined with Glucosamine. Add another tool to your arsenal for joint relief. The synergistic properties of this formula may work more effectively to get you moving faster. Give your joints the nutrients they need and enjoy a healthy, active lifestyle! Also naturally occurring in the body, Chondroitin is believed to help cartilage absorb water and nutrients to keep it hydrated, spongy and healthy. Once the cartilage starts to deteriorate, symptoms such as pain, stiffness, and inflammation appear, indicating signs of arthritis. Support for joint health becomes imperative to continue an active lifestyle. 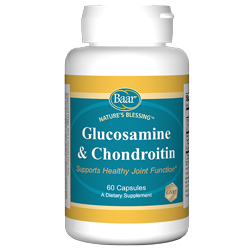 Nature’s Blessing Glucosamine and Chondroitin Capsules work to restore mobility and pain-free movement. Chondroitin slows cartilage deterioration which allows the Glucosamine to work on rebuilding tissues. Support your joint health before the first sign of pain and keep yourself moving! Glucosamine and Chondroitin are compounds that are naturally found in the body, especially in the cartilage found around the joints. These compounds are essential in keeping the cartilage elastic, healthy and strong. As the body ages, its natural levels of Glucosamine and Chondroitin tend to drop, causing the cushioning benefit of the joint cartilage to break down, which often leads to pain and swelling. This can impact one’s daily activities and make moving a struggle. One of the best ways to keep yourself agile is by supplementing with Glucosamine and Chondroitin. This entry was posted in Bone, Joint, and Muscle Health, Natural Products on October 28, 2014 by Dr. Bruce Baar.